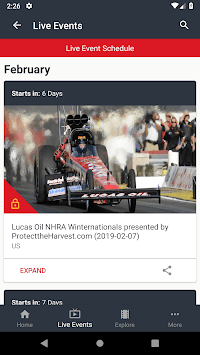 "Stream all 24 NHRA Mello Yello Drag Racing Series events. 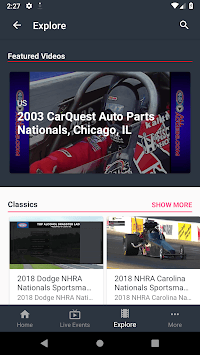 Plus, watch 2017 and 2018 race video on demand as well as historical race footage, exclusive exhibition matches and coverage of the Sportsman and Pro Mod TV broadcasts. Live video will be available on Fri-Sun of all races, with audio available on almost all other race days." 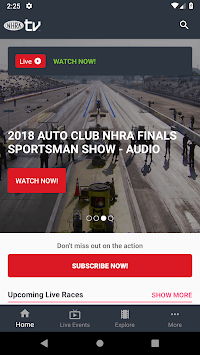 NHRA TV gives you access to reliable and exclusive drag-racing content live and on-demand with the NHRA.TV App.